Tax refund season brings a lot of relief to our debt-strapped clients anticipating a tax refund from their state or federal returns. It can also bring some stress to others. Last week in this blog we discussed how vulnerable tax refunds are to different type of debt collectors. 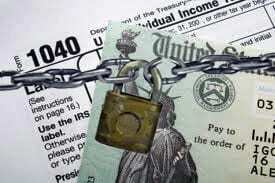 Today’s blog is about how vulnerable your refund is to identity theft. The primary way a tax refund is stolen is by the thief filing a phony tax return using your personal information, including your social security number, to have your refund diverted to an account in their control. The theft of your refund can also occur when a person uses your social security number to get a job or deduct a child of yours on their tax refund. In both of these instances the Internal Revenue Service (IRS) will deny your deduction or hold your return pending an investigation. The burden, unfortunately, is on you to prove the theft. According the the Federal Trade Commission, tax identity theft is the most common form of identity theft. File your tax return early in the tax season, if possible. Mail your tax return directly from the post office. Shred copies of your tax return, drafts, or calculation sheets after they are no longer need. If you have been a victim of identity theft in the past, take extra precautions by contacting the IRS ID Theft Protection Specialized Unit at 1-800-908-4490. Don’t give out your Social Security number (SSN) or that of your children unless absolutely necessary. Research an make sure tax preparers are licensed, accredited, or authorized to file returns before providing personal information. Tax season is a good time to check your credit report annually for suspicious activity. Go to annualcreditreport.com to make sure there has been no suspicious activity on your credit report. The IRA will notify you by mail if they receive more than one return using your social security number. Unfortunately, it will be too late and your refund will be held until the matter is cleared up. If you get a letter or are concerned about tax identity theft, call the IRS Identity Protection Specialized Unit at 1-800-908-4490. If you enjoyed this blog please hit the Google+1 at the top of the page so others can find the information more easily. Here is hoping your tax deductions are great, your tax refund is large, and that you make the decision this year to get a fresh financial start. As Virginia bankruptcy experts, we are here to answer your questions. Our professional bankruptcy attorneys can help you navigate the complicated world of bankruptcy. Contact us below by clicking on one of the buttons or calling.